This Danish aebleskiver recipe by Sally Abé makes a delightfully warming sweet Christmas fritter, ideal for Christmas parties served with a glass of mulled wine. Aebleskiver have been part of Danish Christmas tradition for hundreds of years. Although there is some speculation as to the origins of these little treats, the story goes that after a long day in battle the Vikings made some pancake batter but had no way in which to cook it, so they greased their dented armour, poured in their batter and aebleskiver were born! 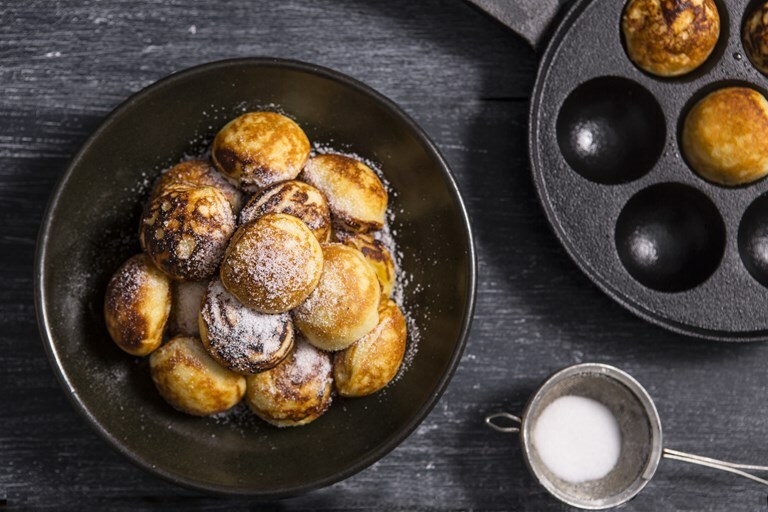 Over the years aebleskiver pans have been developed, normally made out of cast iron but also now available in non-stick coating. I cannot vouch for the authenticity of this story but it seems to be the most common explanation. I can however vouch that aebleskiver are a delicious treat, usually accompanied by a glass of glogg (mulled wine to you and me) during the festive period. Hans Christian Anderson even wrote about them in his 1872 fairy tale The Cripple, and if they're good enough for Hans they’re good enough for me. Aebleskiver (‘apple fritters’) were traditionally made with a slice of apple in the middle, however in recent years this has fallen out of favour to plain aebleskiver that are usually served with some kind of jam or compote. I like to keep things traditional at Christmas so apple it is.